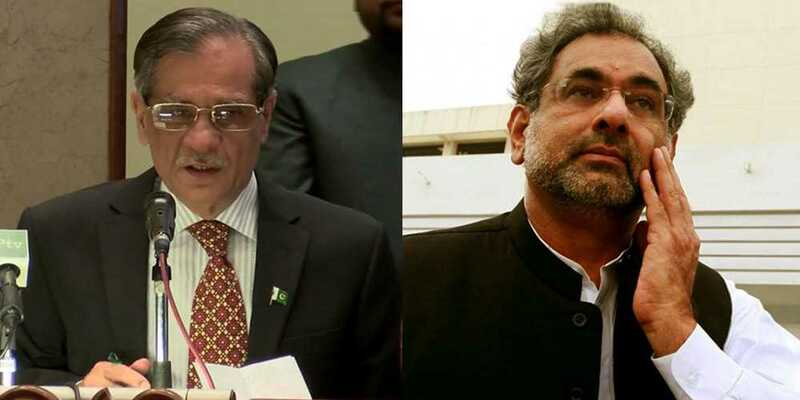 Chief Justice of Pakistan Justice Saqib Nisar has summoned Prime Minister Shahid Khaqan Abbasi as a CEO on fake degree case related to airline employees. According to the details, a hearing was chaired in the Supreme Court of Pakistan regarding the fake degrees of airline employees. During the hearing, Chief Justice of Pakistan said that who the CEO of Air Blue is, on which he was informed that it is Shahid Khaqan Abbasi. Supreme Court issued a notice to the Chief Executive Officer Shahid Khaqan Abbasi, along with Shaheen Airlines and Serene Airlines. Supreme Court ordered that all the officials should be personally present in Karachi Registry. Chief Justice remarked that Shahid Khaqan Abbasi will be summoned as CEO of the airline and not as the Prime Minister. Chief Justice Miyan Saqib Nisar asked that how many companies are operating in Pakistan? The Deputy Attorney General replied that Shaheen, PIA, Air Blue and Serene Airline. The data of 108 employees have been verified, while the remaining 117 people still remain. Chief Justice asked that how many staff of PIA is to be verified. Deputy General told that the degrees of 1978 people are yet to be verified.